Dr. R.L. Kashyap is Professor Emeritus of Electrical and Computer Engineering at Purdue University, Lafayette, Indiana in USA. 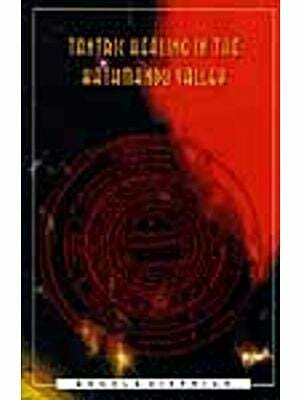 He had his Master’s degree from Indian Institute of Science, Bengaluru and obtained Ph.D. from Harvard University. He is the recipient of many International awards. In 2003 he has received ‘Vedanga Vidvan’ award instituted by Maharshi Sandipani Vedavidya Pratishthan (Ujjain), an autonomous body of HRD, Govt. of India. He has received Karnataka State Award for the year 2012. 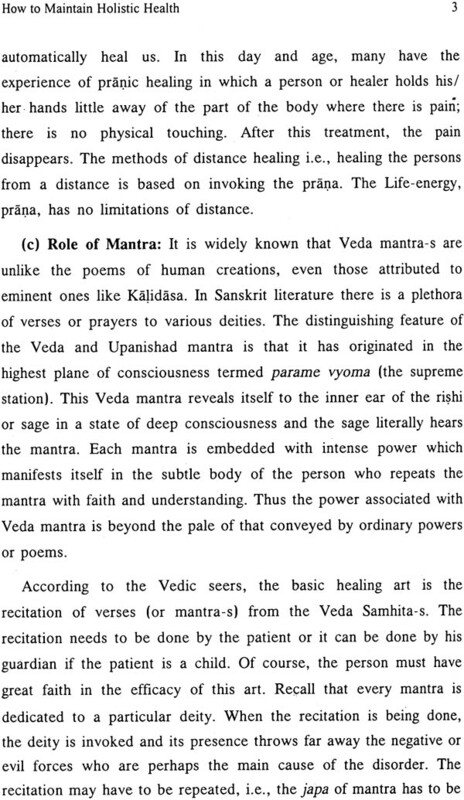 He has written extensively on Veda. 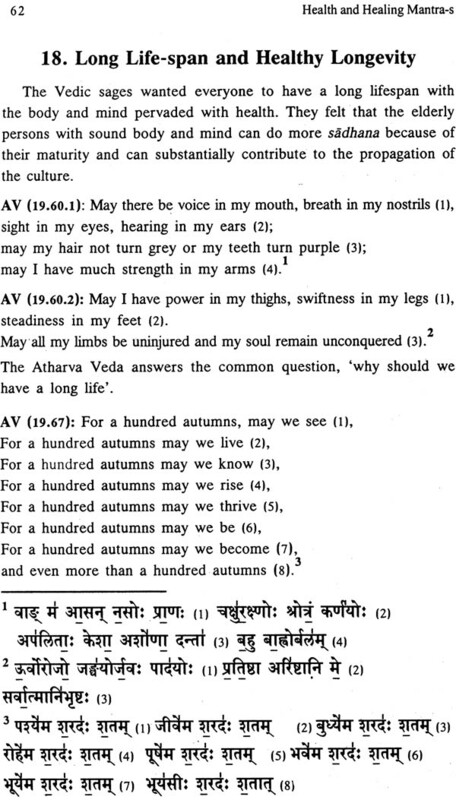 Some of his widely read books on Veda are : ‘Rig Veda Samhita’ – (12 Volumes), ‘Yajur Veda’ (4 Volumes), Sama Veda’ (2 Volumes), ‘Atharva Veda’ (6 Volumes), ‘Why Read Rig Veda’, ‘Rudra Mantra-s’, ‘Essential of Rig Veda’, ‘Essentials of Yajur Veda’, ‘Essentials of Sama Veda’, ‘Work, Enjoyment &amp; Progress’. 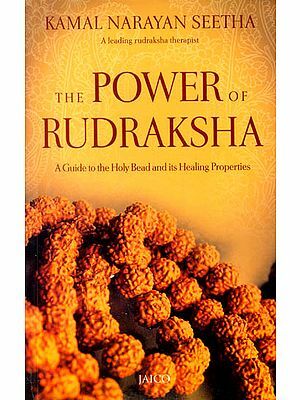 This book gives the mantra-s and the associated healing remedies, available in Rig Veda Samhita and Atharva Veda samhita. This book having 27 chapters is in 4 sections. Section I having 3 chapters gives the overviews. The first chapter delineates some issues connected with Holistic health. Moderns views health as a condition to be free of diseases which are assumed to originate with microorganisms like virus or bacteria. 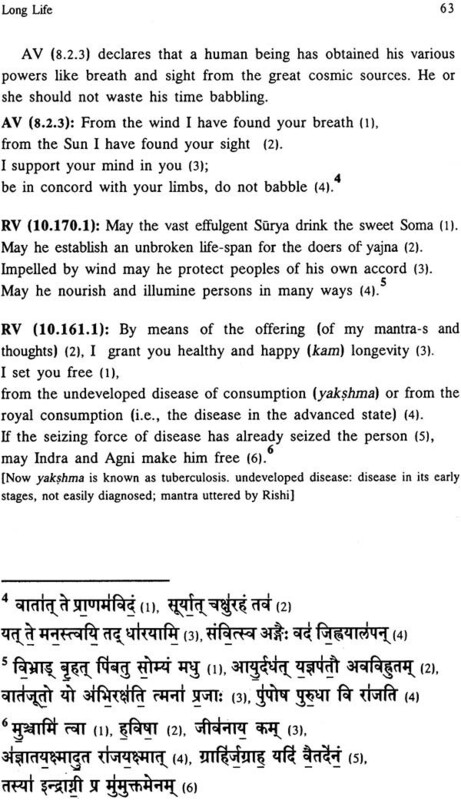 Since there are billions of virus or bacteria, our natural state is implicitly assumed to be one of disease. 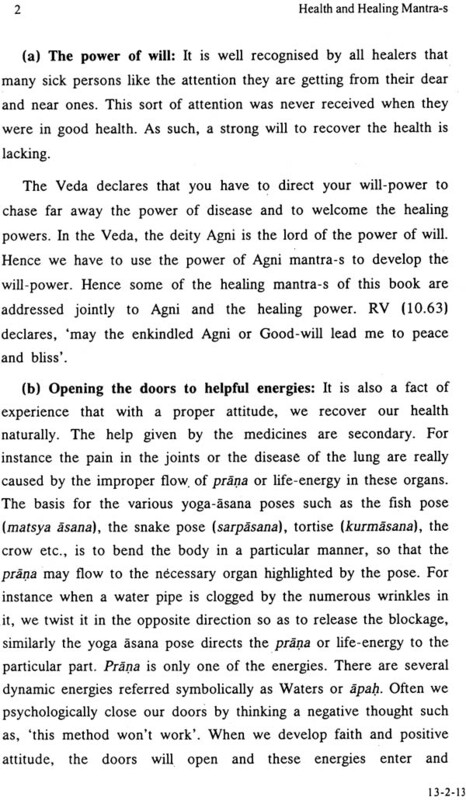 The vedic sages assumed that health is our natural state, which can be maintained with some care. 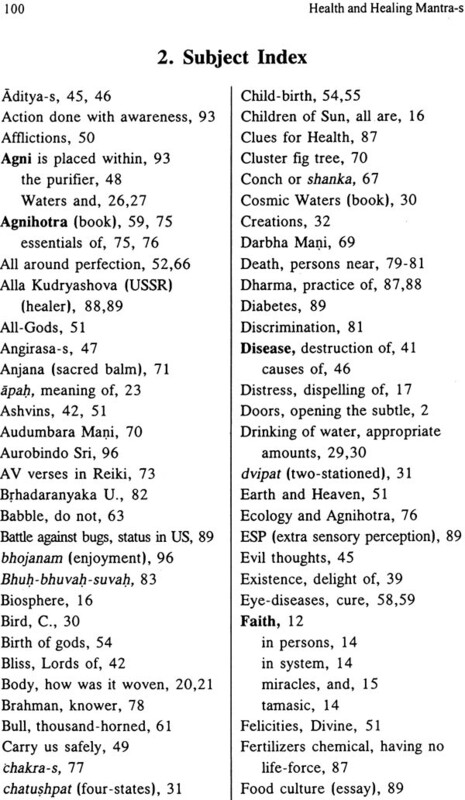 Of course they were aware of various types of diseases. 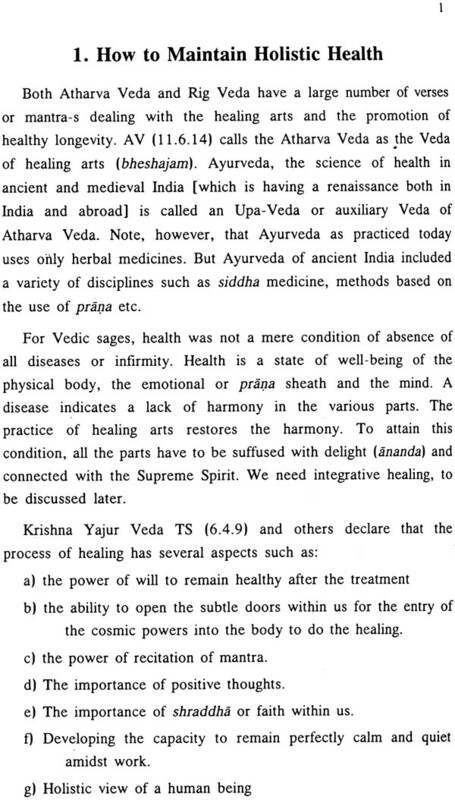 They suggested not only herbal remedies but also the sonic therapy, i.e. 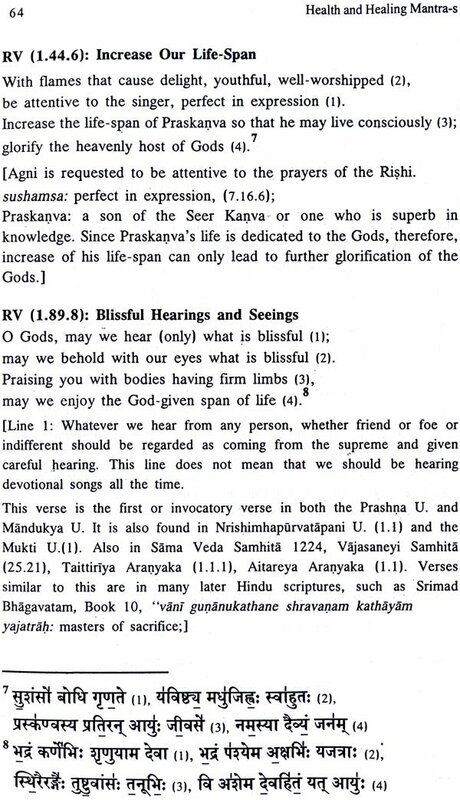 the chanting and hearing of the mantra-s in the Veda Samhita-s. Of course, the role of faith or shraddha is very important, as described in chapter 3. 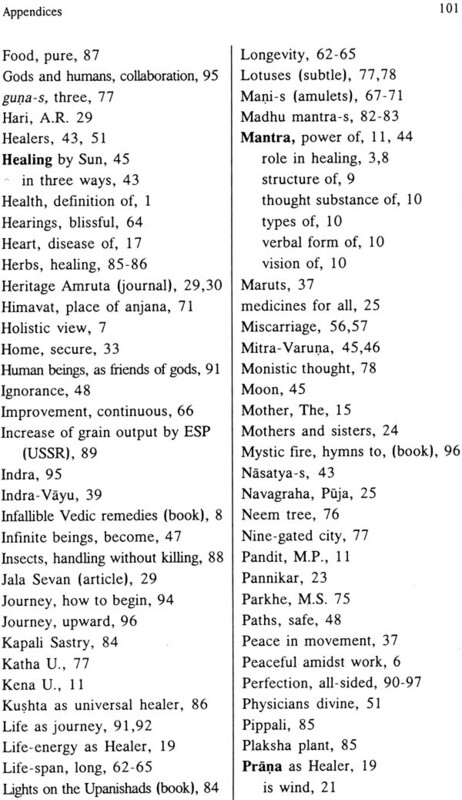 The section II having 15 chapters gives the healing mantra-s associated with various cosmic powers such as the Sun, Prana (vata, or wind), Waters, Rudra or Shiva, Soma, Ashvins etc. 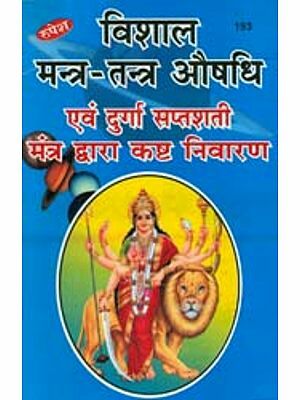 There are mantra-s useful in specific cases like childbirth, the onset of sleep etc. 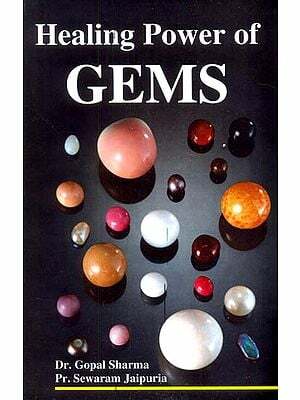 Section III having 3 chapters mentions some alternative therapies like the use of mani or amulets, Agni-hotra and the Japanese healing method Reiki, all of which use mantra-s. The extensive uses of Agnihotra to purify the environment in Europe are detailed in books such as ‘Secrets of the Soil’ by Tompkins and Bird. 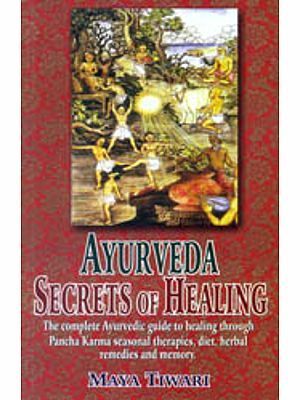 Section IV having 6 chapters discusses some related topics such as rejuvenation, trees and herbs, the recovery of persons near death and some traditional and nontraditional clues for being healthy. The important point is that miracles can be performed by ordinary persons by having intense faith. 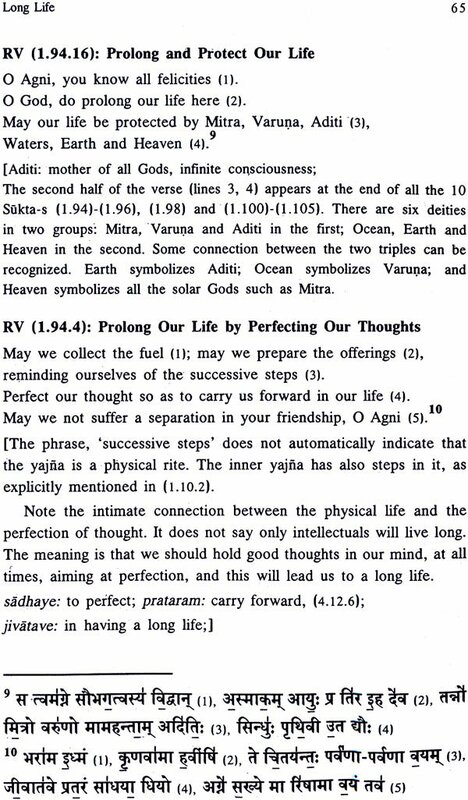 The last chapter gives the goal of all the vedic sages namely all-sided perfection. We should achieve perfection not only with the body and physical things, but also with psychological aspects such as good and cheerful speech and creativity in all aspects of work one does. 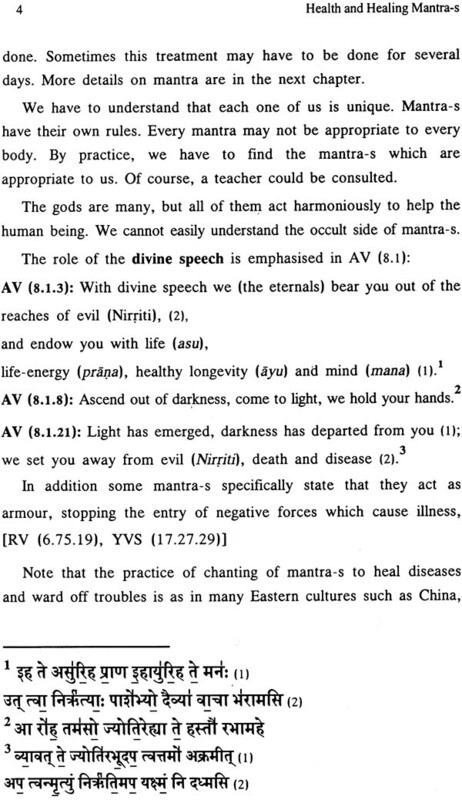 It is also called as divinizing life. 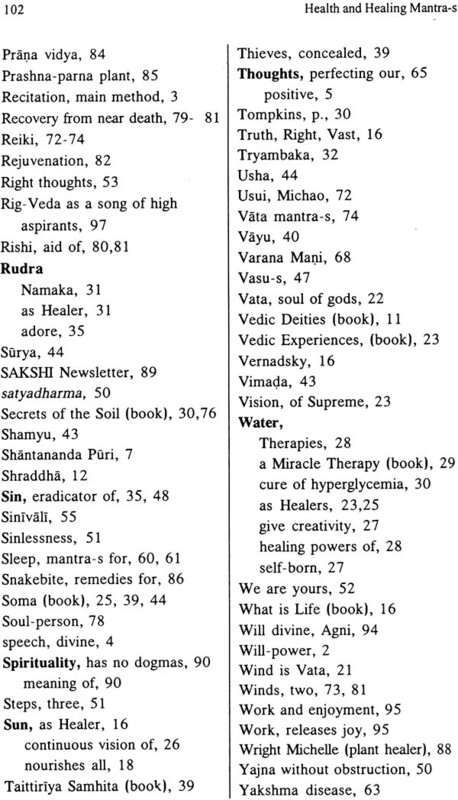 The Sakshi book entitled, ‘Rig Veda Samhita’, having only the text of all Rig Veda mantra-s has a section giving the remedies for many problems, suggested in the book ‘Rig Vidhana’. There have been persistent requests for a book on healing with more details. This books is the result.